Part two of my Frankie Manning’s 95th Birthday Festival recap. Again just a few grammatical edits. You can see a compilation of videos from Thursday night here on my site. This note was originally posted on June 8, 2009. I wasn't planning on sleeping that much anyway. I’ve come to expect it with these kinds of weekends. All in all from Tuesday to Tuesday I got about 24 hours of sleep, averaging about 3 hours every night including a 48 hour stretch from Friday to Sunday morning where I only had about an hour and a half of sleep. I got up early Thursday to witness the dance floor get laid down and the sound equipment brought in. Terrific, I thought to myself. Theoretically if nothing else goes right, at least we have the basic elements to have a dance. Of course, life is never that simple . I won’t bore you with the technical details of every mishap and crises that was averted. I lost count sometime on Friday afternoon. I will say that some of them could have been avoided with better planning, but a good chunk of them came out of left field altogether. My favorite involved the delivery of the grand piano on Thursday. When they brought it into the Grand Ballroom, all they needed was a ramp to bring onto the stage. 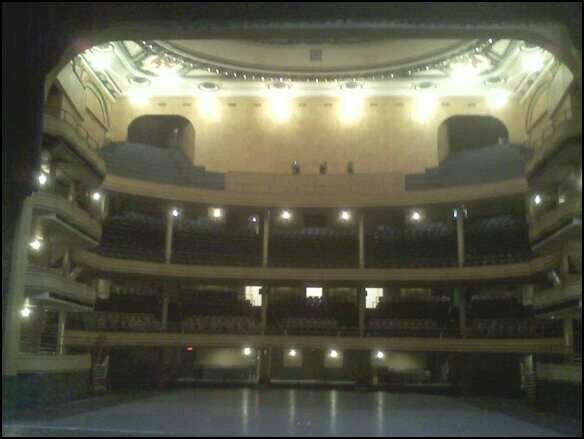 The clever designers of the Manhattan Center hide that ramp behind a panel at the base of the stage. It’s both handy and convenient. That is until you realize that the panel is blocked from opening by several thousand square feet of interlocked dance floor panels. This was one of those problems that required a little outside the box thinking. Event Co-Director Dave Jacoby’s idea basically involved lifting the box. As the name implies, a grand piano is something that is the opposite of small and easy to handle. Nonetheless he got found nine suckers helpful souls to haul that enormous piece of musical instrument onto the stage. That’s pretty much how the days went during the festival. Confidence. Crisis. Curses. Compensate. Rinse. Repeat. There were some cool moments in between. Thursday was also the first day that the cast of the Frankie Show could rehearse in the Grand Ballroom. It was pretty impressive to walk into that place and see the best dancers in the Lindy community all busting their asses physically and creatively for an entire day. I sat with Ramona a bit at one point and even she was as giddy as a third grader on the first day of school. It was one of those times where I wished that I owned a camera because there were so many images that I wanted to preserve. Even when they weren’t on stage there were dancers in every corner of the room stretching, working on their pieces, or giving or soliciting feedback about each others dancing. Later in the day, I was talking to Casey Schneider, and asked what she was up to. She replied that she was doing what everyone else was doing, which was waiting for them to go through the Hellzapoppin’ routine. Then I looked around and realized that people who were supposed to be done for the day were pretty much loitering for no apparent reason. From that high I went down to the registration desk. I’ll admit that was a bit of a disaster. When we decided to open at 3 pm, we didn’t think that many people would be there because the event didn’t start until 6:30, and there was nothing happening until then. At best we thought we’d get a small trickle of early comers and have plenty of time to get ready for the evening rush. Apparently several hundred people also thought that it would be pretty slow, and showed up early to check in. We didn’t have nearly enough volunteers to cover registration because many of the ones that were scheduled decided not to show up. To add insult to injury we couldn’t find the box with all of our signs telling people where to go and what to do because it was buried in a small storage room that had everything else we had shipped in piled on top of it. All in all, I think the registration staff that we did have on hand did the best they could. It was a pretty intense situation down there. One that made our operations issues upstairs a walk in the park by comparison. Operations were made easier by the helpful Manhattan Center staff, which was good since considering the amount of money we had to pay by the hour for them to be there. Still, a very courteous and professional group. They also seemed to get into our event as each day past. In one case, it only took one night. I met a security guard named Ms. Walker right before the Thursday night dance started. She was stationed by the production booth all night so I passed by her the million and one times I went to and from that area. As the night went on, I noticed her relaxing a bit from her rigid authoritarian stance and she eventually got down with her bad self once the night got into full gear. To be honest the evening dance is a bit of a blur to me at this point. I think I remember Gordon Webster’s sound check more than how he played during the late night. I remember being impressed with Gordon’s song selection. It sounded like a top ten of current dancer favorites including Fats Waller favorites like "Yacht Club Swing" and "24 Robbers." Hearing that song live blew away at least one lead from the Midwest who couldn’t stop raving about it at the end of the night. I feel a little bad for the New Orleans Jazz Jazz Vipers because of all the stuff going on (contests, performances, and such). I don’t think they were able to settle into any kind of groove before Gordon Webster took the stage. Gordon was really able to get the crowd going with his stuff. I was wondering how he was going to deal with the end because I gave strict instructions that he had to be done by 3 am. Our problem was that doing anything in New York City is super expensive and going over our allotted time at the end of the night would have hit us with a big penalty that we just couldn’t afford. However, by the time we got to 3 am after Gordon finished his announced last song, the crowd predictably demanded more. And they weren’t going anywhere. Gordon obliged, but came up with a clever compromise. Once his band started playing, the horns went onto the floor to get everyone to follow them in an impromptu second line which they led around the room and eventually out the door. Ladies and Gentleman, Gordon Webster FTW. Once we cleared the ballroom, I was ready for bed, but I also remembered that I hadn’t eaten since breakfast, so I headed to the diner with Tena nd her Houston entourage/extended family plus Alexia and Ann. There I was reminded how tight the Houston people are, something I noticed working with them at ILHC. There’s a intense family like loyalty in that group that I think pushes them to work that much harder because they all know they all depend on each other to make each other’s lives easier at an event. They make up for that by giving each other a hard time when they're not working. Despite the geographic differences, it wasn’t too much different from the vibe I got from the New York crew, especially the Jelly Roll veterans. You would think that there would be more of a cultural difference between the two groups, but not so much in reality. Besides the accents. I felt pretty comfortable working with both groups, partly because of my personality, and partly because I had some feeling for where everyone was coming from: I was originally born in the Bronx, but I’ve spent almost half of my life in the pseudo-South of DC, which bears a closer resemblance to Houston in terms of pace and congeniality than it does to New York City. That dynamic would serve us all very well in the days to come.